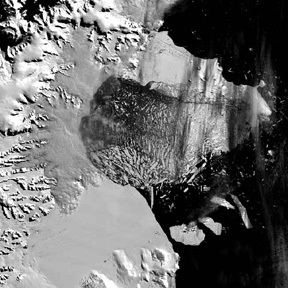 Recent Moderate Resolution Imaging Spectroradiometer (MODIS) satellite imagery analyzed at the University of Colorado's National Snow and Ice Data Center reveals that the northern section of the Larsen B ice shelf, a large floating ice mass on the eastern side of the Antarctic Peninsula has collapsed. Between Jan. 31 (left) and March 5 (right), the ice shelf lost about 1,255 square miles of area. 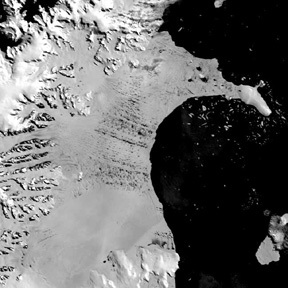 MODIS image courtesy of NASA's Terra satellite, supplied by Ted Scambos, National Snow and Ice Data Center, University of Colorado, Boulder. Read a related Geotimes Web Extra from February.